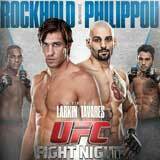 Review: 2014-01-15, some good exchanges and a nice finish: Luke Rockhold vs Costas Philippou gets three stars. The former Strikeforce middleweight champion Luke Rockhold (10-2-0, 80% finishing rate) entered as the No.6 middleweight in the world, he fought just once in 2013 when he was defeated by Vitor Belfort with a spectacular spinning kick (one of the best knockouts of 2013, we rated it with four stars) but before that bout he had nine consecutive victories. His opponent, Constantinos Philippou, better known as Constas Philippou, (12-3-0, 58% finishing rate) entered as the No.15 (currently the #1 in this weight division is Chris Weidman) and he also fought just once in 2013 losing against Francis Carmont after five-fight win streak. 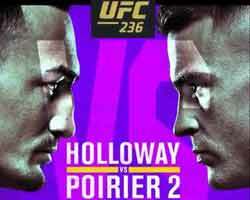 Rockhold vs Philippou is the main event of “UFC Fight Night 35”. Watch the video!